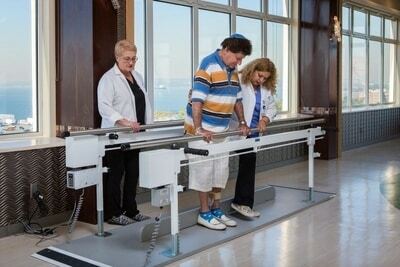 Apart from supervising clients and assisting them, we provide a stunning array of rehabilitation therapies. These aid recovery and well-being and bring a smile to many a face. 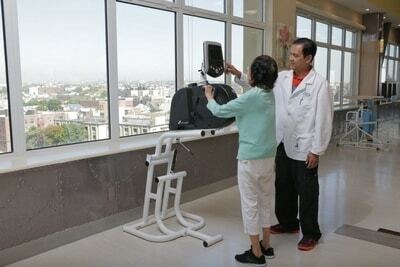 Physical exercise, if well managed, can promote the healing process and give patients a sense of achievement. 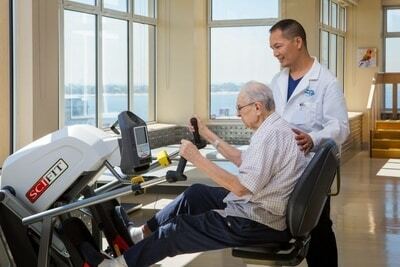 Exercise is part of restorative therapy at Haym Salomon Home which assists orthopedic and musculoskeletal conditions, and arthritis-related joint pain. Our highly skilled team of physical therapists conduct assessments of each patient and devise safe, tailor-made programs. Education of patients and their families is an important part of the package. Our specialist equipment is fun to use and aids progress. All activities are closely supervised. Our speech therapy professionals treat speech, cognitive, communication and swallowing disorders. These ailments are common after a stroke or in the later stages of Parkinson’s disease. We develop individualized treatment programs to ease the difficulties people may have. The occupational therapy rehab unit helps patients with serious conditions to achieve greater independence in their daily lives. Tailor-made programs are developed in consultation with patients and draw on the experience and specialist skills of our staff.